A tale of ‘like for like’ third party inks. 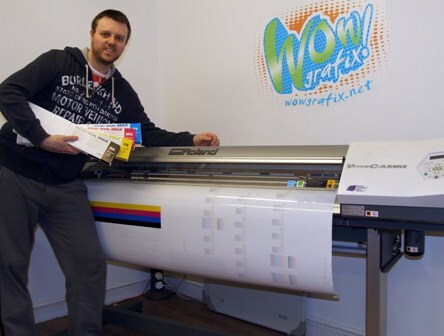 Paul Kearney back on track with Eco-Sol Max inks in his Roland VersaCAMMUK based WOWgrafix has seen a dramatic improvement in the performance of its wide format machine since going back to using Roland Eco-Sol Max inks in its VersaCAMM VP-540i. The company, which specialises in van sign writing, signboards, vinyl banners locally and nationally via its website WOWgrafix.net, was approached a couple of years’ ago by a salesman offering a ‘like for like’ third party ink solution for the Roland machine at a very competitive price. At first, Mr Kearney says, the inks seemed to work well, although, they did notice that one of the side effects were that the inks emitted a very strong odour. And, while the inks were branded as bio inks, which made them sound safer and gentler, they were, in reality, strong solvent-based and very corrosive on the machine’s parts. Soon afterwards, WOWgrafix got its first signs of the problems to come: the heads started needing cleaning more often, followed by blocked nozzles and deflections. Then the cleaning cycles on the machine became so frequent it started impacting on production schedules. After this, the banding on the prints started. “At this point,” continues Mr Kearney, “we weren’t aware it was the inks causing all the problems, so we called in a local engineer and we replaced cap tops and dampers (more than once), as well as the wipers. All this failed to solve the problem so the conclusion was that it had to be the inks. When we spoke to our ink supplier, it turned out some of the inks had already been removed from the market, which immediately set off alarm bells. Eco-Sol Max ink Mr Kearney says every step of the way was a battle, and exasperated, he posted the problem on a sign maker’s forum. And, while this made the third party ink supplier take more action to assist, the banding problem continued and the recommended solution was that WOWgrafix should always print on high quality setting, which was just not practical from either a cost or production perspective. Soaking the heads every weekend for six weeks was also proposed and tried, but just led to the use of a lot of cleaning fluid with no improvement to the heads. The supplier finally agreed to replace two heads, but this still left two damaged heads in the machine. Mr Kearney says the whole experience of going to a third party ink supplier was a nightmare. So much time and money was wasted on cleaning, engineers, banding problems and inks. And when customers who have always been happy are then not happy with the quality of the work and start sending it back, the business begins to really suffer. “It’s a salient lesson that saving money at the point of purchase might actually cost you down the line. You get what you pay for, that’s for sure. The wide format machine is the sign makers’ life line to success, and it’s just not worth the risk of damaging this essential business equipment and customer relationships to ‘save’ a few pence per litre. “Since we’ve moved back to Roland inks, business, and the machine, has been great. No banding, no break downs, happy customers and a productive business. I’m glad to be back with Roland,” Mr Kearney concludes.